Shenandoah Mountain stretches across Augusta and Rockingham Counties in the George Washington/Jefferson National Forest (North River Ranger District). It is a biodiversity treasure, with native forestland for native species habitat, recreation, hunting, fishing and clean water. The Shenandoah Mountain complex includes the largest roadless area east of the Mississippi (Little River roadless area), one of Virginia’s highest elevations (Reddish Knob at 4,397′) and over 170 miles of trails. This is the literal “backyard” of the Headwaters Master Naturalists, and citizens of the counties we serve. It is important to know and appreciate the rich natural heritage we live beside, and depend upon. Last year’s planned Wildflower Tournament was cancelled due to thunderstorms. This year’s is sure to offer more perfect weather! To this end, multiple guided hikes are tentatively planned for Saturday, May 10th, 2014, for anyone willing to come out. The focus of the walks will be on the diverse, abundant wildflowers expected to be adorning the trails this time of year. The “tournament” aspect is by photography. Who can “photobag” the most species blooming that day, as a measure of the biodiversity of Shenandoah Mountain? A web-based slide show will highlight each trail’s finds. 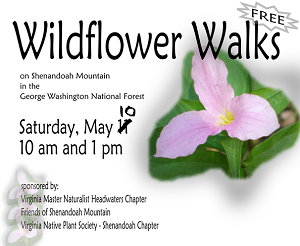 Master Naturalists and those in training will work together with Friends of Shenandoah Mountain and the Virginia Native Plant Society (Shenandoah Chapter), as well as the US Forest Service, North River District, to plan/host four accessible/rich wildflower hikes on the Shenandoah Mountain trail complex over the day. The schedule and trailhead locations will be publicized locally, and will be open to the public. Teams of Master Naturalists in training, a Master Naturalist or at least one wildflower “expert” will accompany and guide each group. These volunteers will follow all Master Naturalist guidelines, and be reasonably prepared with safety procedures and first aid/communications devices. October 27, 2013 in Wildflower Tournament 2014.